Spooky Arachnophobia SPIDERS PARTY TAPE is great for indoor or outdoor use. Made of all-weather poly plastic material with printed assorted species of scary realistic Arachnid Spiders. 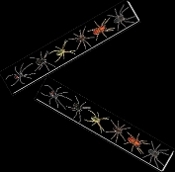 Each Colorful Spider Print Party Caution Fright Tape Ribbon Border measures 3-inch (7.5cm) Wide by 20-feet (600cm) Long. Perfect Creepy indoor outdoor decor for wrapping around poles, posts, banisters, or just about anything in your haunted house!